Target is a standard NRA B8 bullseye replacement center. Scoring is for actual points so a 10-ring hit is worth a lot more than peripherals. 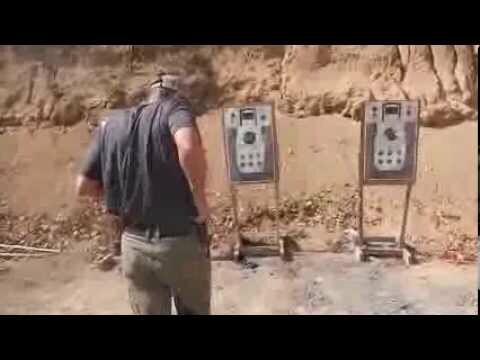 Start from the holster at 25yd. On the buzzer, draw and fire two rounds (2). Advance to the 15yd line keeping gun safely in control, fire two (2) rounds. Advance to the 7yd line keeping gun safely in control, fire three (3) rounds. Fire three (3) more rounds while advancing forward from the 7yd line. Score is simply listed as points and time. Ethan recommends using 80 points in 20 seconds as a passing score. Using a B8 target center instead of the big zone of an IPSC/IDPA target is what makes this such an interesting drill. Being able to turn in precision at speed (especially at the 25 and 15yd lines) is very representative of the performance standards Ethan and his military colleagues expect in their real world day jobs. This and Ethan’s other new test appeared in the January 2014 edition of SWAT Magazine.